SPAIN 1701 8 ESCUDOS - DOUBLOON - COB "PIECES OF EIGHT!" 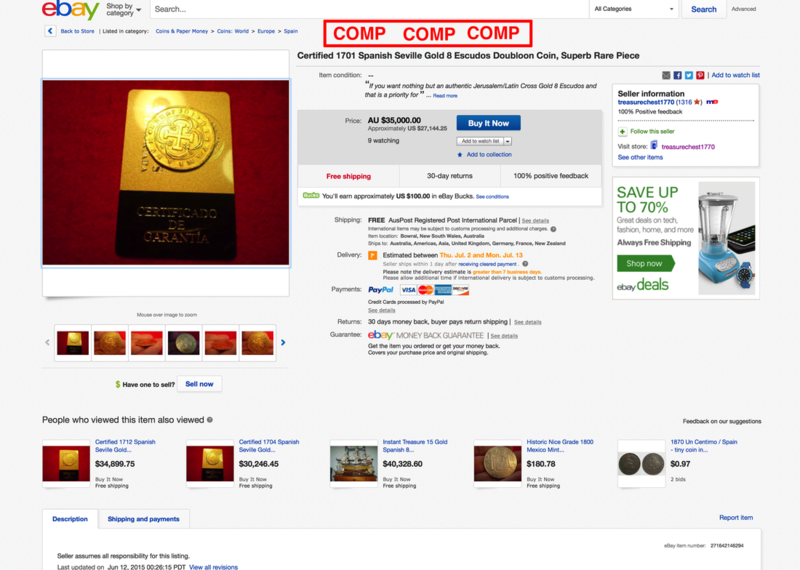 AUTHENTICATED WHAT'S MOST INCREDIBLE ABOUT THIS PIECE IS THE ROUND PLANCHET / FLAN AND THE CENTERING! THE STRIKE IS VERY BOLD WITH NO DOUBLING! THIS IS A VERY LARGE FLAN (DIAMETER) AND IS HEAVY! THERE ARE NO OTHERS LISTED AT ALL WITH NGC AS EVER BEING CERTIFIED!!! THIS PIECE MAY VERY WELL COME FROM THE "PLATE 1715 FLEET SHIPWRECK" I'M AN ADVID COLLECTOR OF EIGHT ESCUDOS AND WOULD STRONGLY RECOMMEND FOR BUYERS TO "ONLY" BUY COINS THAT ARE AUTHENTICATED FROM THIS TIME PERIOD!